I know I showed a Japanese artist’s work last week, but I got so excited when I came across this woodcut print that I just had to share it with you. It’s a perfect example of saturation of color (also known as intensity). Saturation has to do with the lightness or darkness of a color. A color thinned with white or water is low saturation, while an almost pure pigment is high saturation. Highly saturated color has to do also with my subplot for this posting: the Western influences on Japanese woodblock prints. This is the later period of the ukiyo-e style (images of the floating [transient] world), the Meiji period (1868–1912). Terasaki was a painter and printmaker who specialized in prints of everyday life and beautiful women (bijin). As a “war correspondent” he produced multiple color woodcut prints in the ukiyo-e manner of battle scenes during the Sino-Japanese War (1894–1895), a struggle over control of Korea. Such battle scenes were usually composed of three vertical sheets presenting a horizontal triptych scene. After the battle prints, Terasaki began to produce stunning, realistic landscapes such as this. The minimalist feeling of his work, along with the asymmetrical arrangement of forms, was a major influence, ironically, on Western artists that led them to abstraction. After isolationist policies in Japan were eased a bit in the mid-1700s, artwork from Western Europe, primarily in print and book form, flooded into Japan. The prosperous middle-class, which patronized the woodcut prints of pleasures of everyday life, were eager to see images of mysterious other countries they were forbidden to visit. While landscape was a major subject matter in Japanese painting, it only became popular in the woodcut prints from the 1830s on. Japanese artists adopted a horizontal format (as opposed to the vertical format that dominated beauty and theater prints) in order to produce sweeping vistas of landscapes that they saw in Western landscapes, a contrast to the vertical format that dominated landscape painting. During the 1800s, Japanese artists also began to experiment with the more saturated manufactured colors from the West, often combining them with the native colors produced from natural minerals and vegetable matter. Because of their chemical makeup, Western colors were much more saturated, a property of these colors with which Japanese artists eagerly experimented. 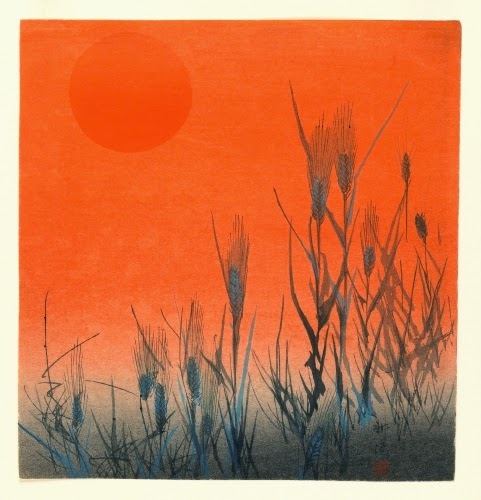 Compare the intensity of the orange-red sky in the Terasaki print to the Totoya print of 70 years earlier. The color in the Totoya print looks almost washed out, although the background colors are meant to discreetly frame the subject. 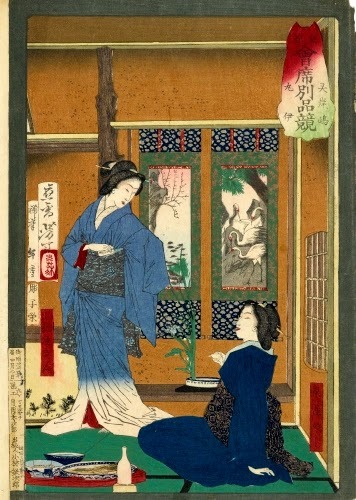 In the Terasaki print, the gradation in intensity was achieved by printing the background color first, rubbing from the bottom to create a lower saturation. That background was then carved away around the rice forms that were printed with a separate block right over the orange. Another aspect of Western art that some Japanese artists adapted was a greater interest in realism. Compare the setting sun behind the crane with that behind the ripening rice (the rice harvest in Japan is in September). 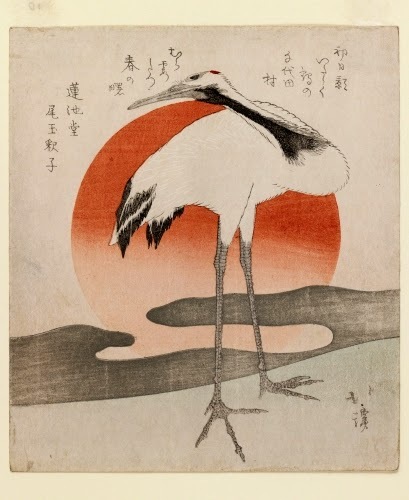 The pale (low intensity), vaguely placed clouds (that seem to be right behind the crane) and ground, and pale sun that frame the crane are in strong contrast to the brilliant reds and orange of the Terasaki sunset. Also, the space is more in keeping with Western ideas of recession. While the Totoya print includes a poem that floats in the air around the crane, Terasaki has eliminated such a lyrical device in favor of simple emphasis on the physical reality or foreground, middleground, and background. Apropos of “foreground, middleground, and background,” another aspect of Western realism adopted by Japanese artists was the illusion of three-dimensional space with one-point perspective. In one-point perspective, all of the orthogonal lines (lines perpendicular to the horizon line) converge in one point on a horizon line, whether it is visible in the composition or not. 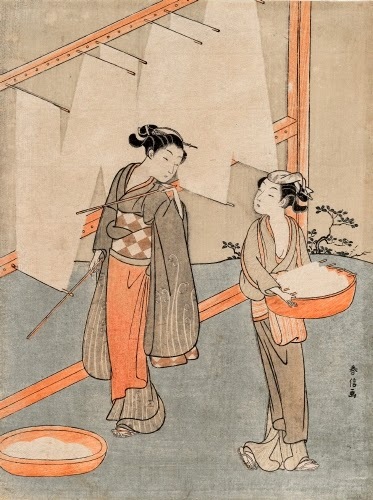 Typically, in Japanese and Chinese art, the orthogonal lines actually converged toward the foreground, evident in the Harunobu print. Also evident in the Harunobu print is the low-intensity color of traditional Japanese pigments used in the woodblock prints. The Yoshitoshi print shows the full impact of Western influence on the prints. Although the women’s faces are still somewhat stylized, their clothing, interior, and color all show Western influence. The saturated color is particularly stunning, especially the “Berlin Blue” color on the woman in the foreground. That was one of the colors with which Japanese artists liked to experiment. The room is constructed in one-point perspective right down to the lines in the mat on the floor. Japanese elements do persist: the vibrant patterns, artists’ seals and inscription describing the scene, and the accoutrements in the foreground (a still life) that were traditional in serving customers.